Another Buddhist Geeks conference has now come and gone. As I write this, I am sitting in the Denver airport waiting to fly onwards to a trip for my work. This was the second of the (hopefully) annual Buddhist Geeks conferences that grew out of the Buddhist Geeks podcast over the last five years or so. Last year, we met in Rosemead, California, which is just outside of Los Angeles, at the University of the West. This year, it was held at the University of Colorado in Boulder, Colorado, which is also where Buddhist Geeks has been based as an endeavor. As I recall, the hope for next year is that it will occur in San Francisco, California, which would be rather convenient for me. This year seemed a bit more ambitious than last year’s event. Last year, it felt like the conference was bootstrapping itself into existence. A place was found to hold it through the network of Buddhist practitioners, scholars, and acquaintances in the Los Angeles Area, as the University of the West is a wonderful Buddhist university. The speakers were drawn from people that Vince, as the primary organizer, knew personally and had often interviewed for the podcast. It was all very fresh and unhindered or constrained since it was the very first event. This year, much of the formula from the first conference was duplicated but you could see some sense of trying to refine or modify it. The events were pretty much divided into three types: loosely themed collections of talks, panels on a theme, and a few keynotes given by noted individuals to bracket the other two types. There also seems to have been an attempt to expand on the people invited as speakers, to broaden it to include a few well-known figures, who also acted to draw in people who didn’t attend the first event. The opening keynote was done by Surya Das and the closing one was done by Stephen Batchelor, both noted authors, practitioners, and teachers, who had not attended last year. In addition to the format of sessions above, the conference also continued to have “un-conference” style sessions in the theme of Foo Camp and similar endeavors. On the first full day, there were two, back to back, 40 minute sessions where people could break up in eight or so groups, depending on interest, to discuss themes that people had put up on a board as topics of conversation. On the final day, there was one longer 60 minute session of the same. These sessions had foci all over the map. One of the ones that I attended focused on monasticism as a technology and whether it could be divorced from its religious context and used as a tool for another way of forming community and living. The organizer was and is involved in the Art Monastery in Italy where a group of artists live together in a monastic community, keeping hours and such, in an older Christian monastery that they purchased. 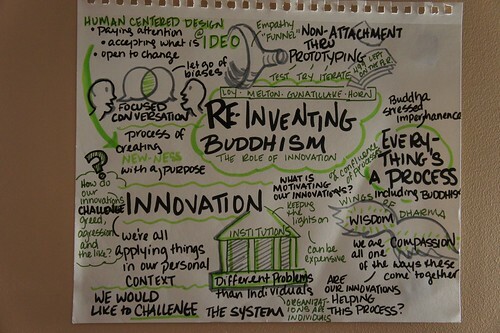 Much of the overall focus of Buddhist Geeks 2012, just as it was in 2011, is how we are working with, developing, and adapting this thing which is “Buddhism” or “the Dharma” in the West in our rather interpenetrated and now highly mediated world of the 21st century. There is also a certain subtext of “The boomers are aging and will gradually be leaving us. What will be being doing with their legacy now that the Dharma is established?” As a whole, it is really about finding a form of Buddhism (or even BuddhismS) that will work for us in the “West” (as meaningless as that term really is) in the coming generations or centuries. What do we do with the legacy that we have inherited and, at least partially, seen established? This also involves one of the overarching themes of my own “Open Buddhism” ideas which is that we are a community composed of people trained (or partially trained) in many different forms of Buddhism, often mixing and matching pieces from what are distinct traditions in their homelands. This is an “Aloha Amigo” problem as an old friend of mine was known to say. It must be pointed out, and it is a fair thing to wonder about, that the crowd at the conference was overwhelmingly composed of Americans of Western European descent (aka whitey) and with little visible involvement by any sort of minority, whether it be ethnic or sexual. I expect my friend at the Angry Asian Buddhist blog would have more than a few, quite justifiable, words about whitewashing and the possible marginalization of Buddhism as it lives in the Asian American communities. (In fact, as I write this, I see there is a new post up on this very issue.) This is still a nut that I haven’t seen anyone make a very successful attempt to crack. The fact that tickets to the conference cost a few hundred dollars plus airfare (or other transport) to Boulder and a motel room or the like means that people of some means were the basis for attendees. This isn’t a criticism of the conference per se but we must be clear that this winnows the potential types of individuals who will attend an event like this on top of the fact that every speaker invited to speak was white except for one (though not all male). This was ameliorated a little by the fact that, for the first time, the event was live streamed to anyone who signed up for free. I expect that the recordings of the sessions will be available for free as well, just as they were last year. This opens up access a bit, even if not for in person attendance. I was asked by a teacher of mine if I felt that the event was “worth it” when all was said and done. I found the conference to be inspiring overall. There were definitely a number of calls for action in the discussions of “DIY Buddhism” and an overall encouragement for people to take the initiative to be the change that they want to see (to use an old catchphrase). Don’t passively wait for people to address the problems that exist in how the Buddhadharma is expressed in America but take the initiative to do something about it. I also enjoyed the chance to meet, talk, and network with others who share my interests, as someone who is a Buddhist but also very much a geek. I saw a number of friends from last year and made a number of new ones. I also saw a few people from my own local community in the Bay Area (there were at least two other “Open Sangha” attendees there). I think that the event is worth attending. Ken McLeod, a wonderful teacher, also spoke to the fact that nothing else likes this conference exists. 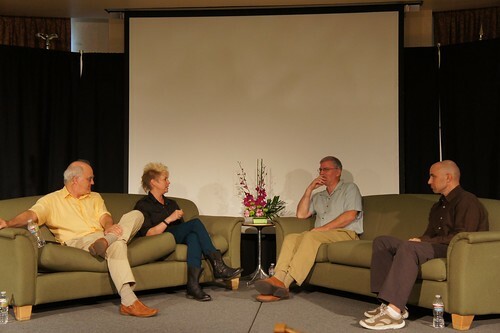 In fact, outside of a few well known Buddhist sects or churches having internal conferences, I cannot think of any other Buddhist conferences held in America that are focused on practitioners. This means that Buddhist Geeks serves a rather unique role as a conference and one that we’ve needed for at least the last 15 years according to Ken. Update: Nathan from the Art Monastery corrected me in that they don’t all do the hours there and do not actually own the monastery at this point.